Tsuru no Mai Bridge was built on July 8, 1994 overTsugaru Fujimi Lake. 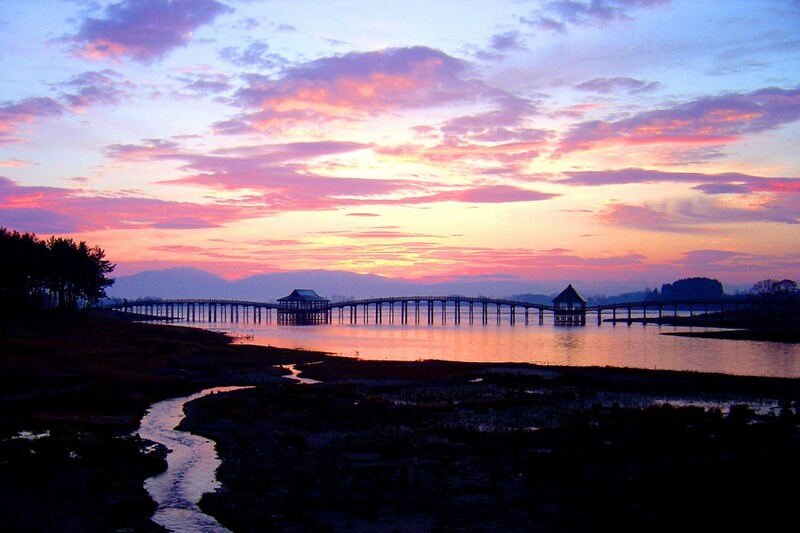 It is the longest wooden bridge in Japan. The bridge is triple arched and is 300 meters long. A shadow of Mt. Iwaki beautifully reflects on the lake surface. 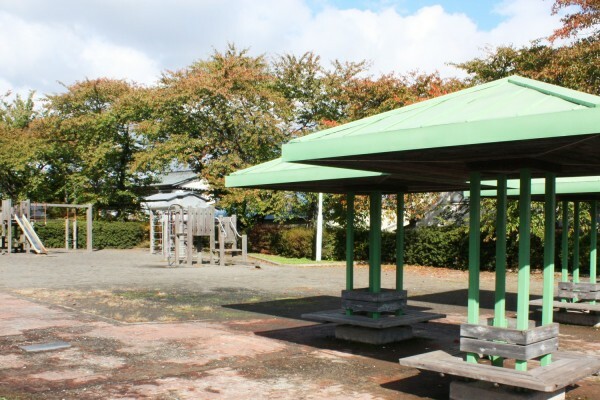 Fujimi Lake Park is a lakeside park featuring 12.4-hectare space with 360-degree-loop slide, children’s play area, a picnic and barbecue area. Additionally, cultural buildings such as Towada Shrine and Byakue Kannondo Hall are also located in the park. 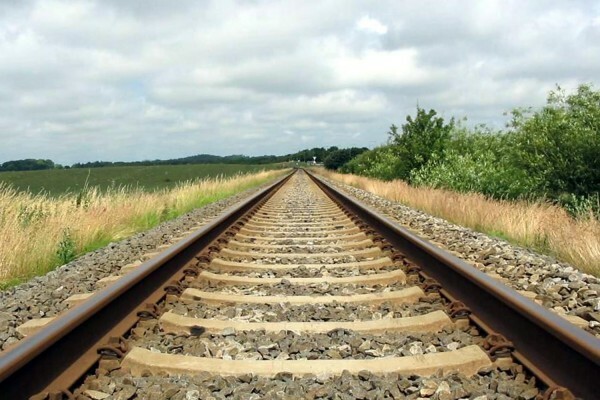 JR Gono Line is a railway line, operated by JR East, which runs from Higashi-Noshiro Station (Noshiro, Akita) to Kawabe Station (Inakadate, Aomori). A railroad switching occurs at Kawabe Station which reverses the train’s traveling direction. 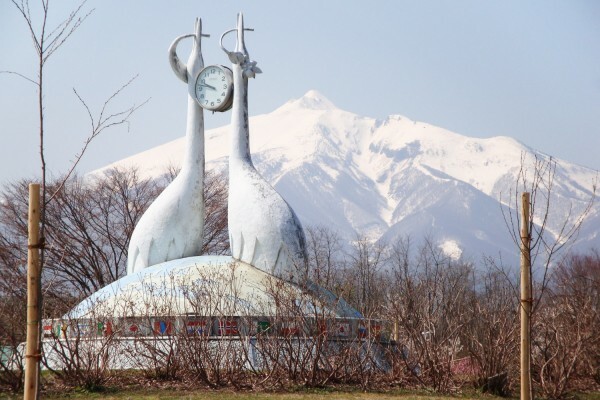 Village name Tsurudomari consist of two words “Tsuru (red-crowned Crane)” and “Domari (Stay)” According to Tsuruta history, it is believed that this area had many swamps and was a winter-feeding site for many red-crowned crane. 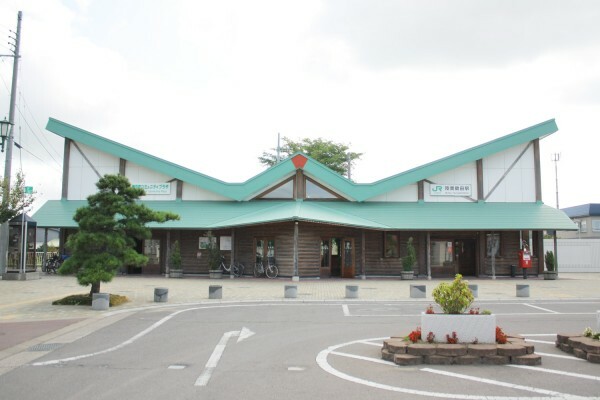 The station is called Mutsu “Tsuruda” Station, not Mutsu “Tsuruta” Station. 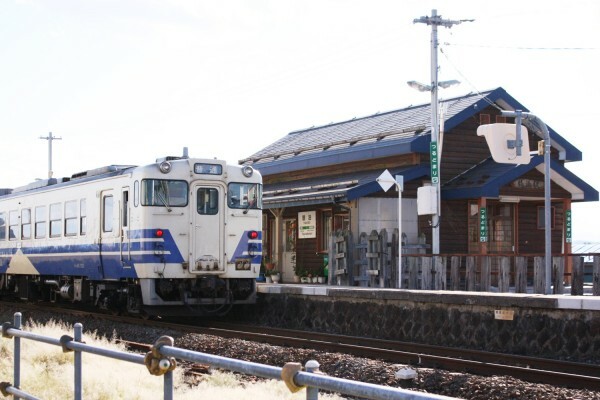 It was named “Tsuruda” since there already was a station called “Tsuruta” in Utsunomiya, Tochigi. To avoid confusion, “Mutsu”, which indicates the old providence of Tohoku region, was added in front of “Tsuruda”. 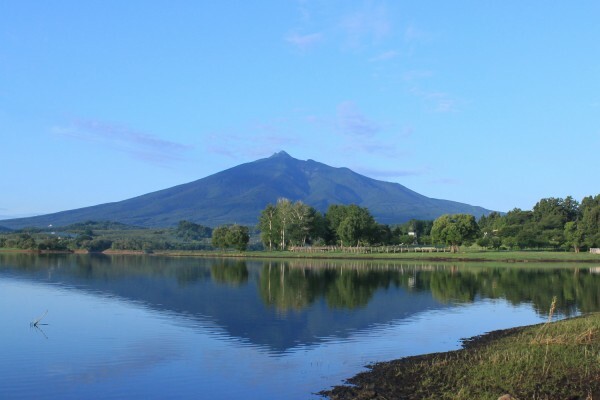 Mawarizeki Otameike, commonly known as Tsugaru Fujimi Lake is a largest water reservoirs in Aomori Prefecture. Construction of the embankment project started in 1660 under the direct management of Nobumasa Tsugaru, the 4th feudal lord of Hirosaki Clan. 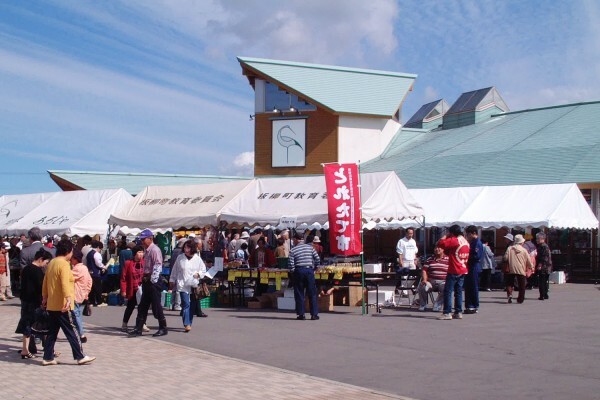 Michi no Eki Tsuruta: Tsuru no Sato Aruja (Roadside station: Crane Village Aruja) is opened as a social gathering place, and also functions as a regional and cultural exchange center. There is a huge tree called “Todoroppo” in the backyard of Saito family house in Myodozaki near Tsugaru Fujimi Lake. 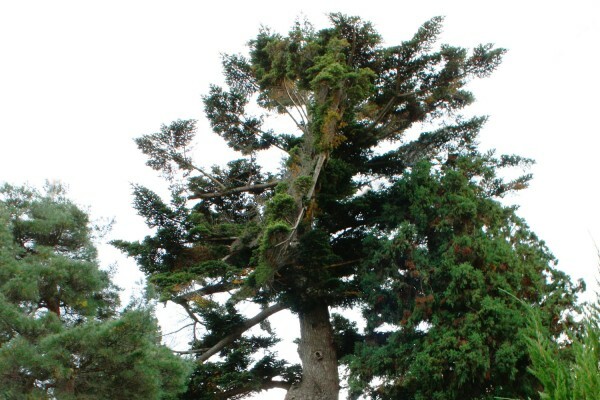 The tree is estimated about 350 years old, 30 meters tall with 6 meters in girth. 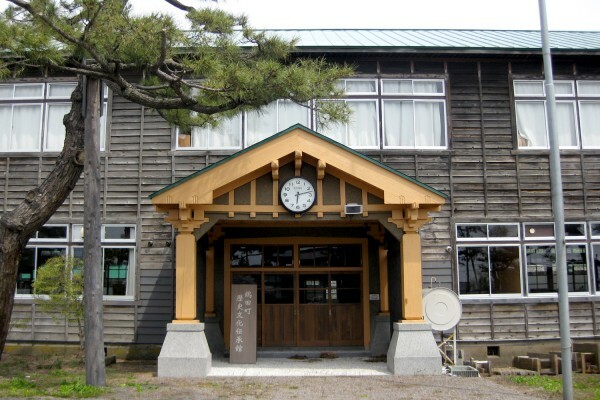 Tsuruta History & Culture Museum was first built as Mizumoto elementary school. Mizumoto elementary school was founded in 1876 and closed its doors history in 2004 due to lack of students. Quaint wooden school building was built in 1936. During the Edo period (1603 – 1867), Tsuruta was a winter-feeding site for many red-crowned crane. 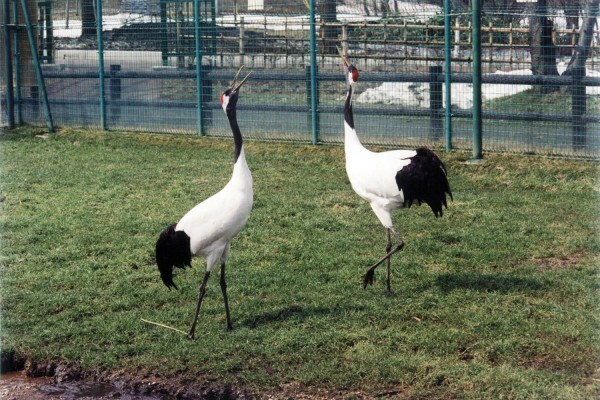 In 1997 a pair of red-crowned crane was acquired from Heilongjiang, China to nest in Tsuruta. 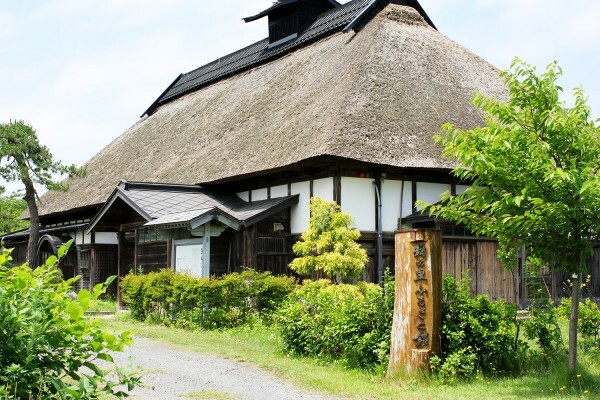 Furusato Kan is a reconstructed 120-year-old Kawamura House which was relocated from Ushiro Nakano village to its current location near Fujimi Lake Park in 1995. Sakura (Cherry blossom) Zutsumi Park was built in August, 1999. 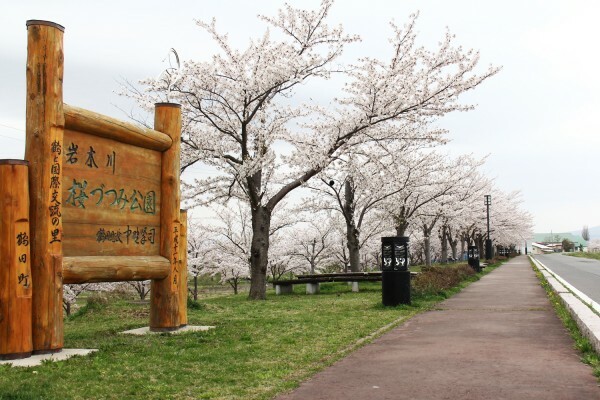 As its name suggests, in spring, beautiful Sakura scenery can be viewed alongside the road. As you rest on a bench, gorgeous view of Mt. Iwaki, also known as Tsugaru’s Mt. Fuji, can be enjoyed as well. 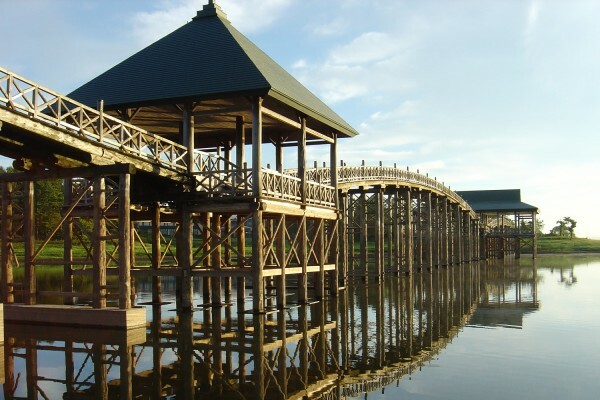 Kakuju Park is located in central Tsuruta about 10 minute walk from Mutsu Tsuruda Station. The park offers playground, pond fountain, floral clock, multipurpose and festival ground, tennis court, memorial trees and monuments. 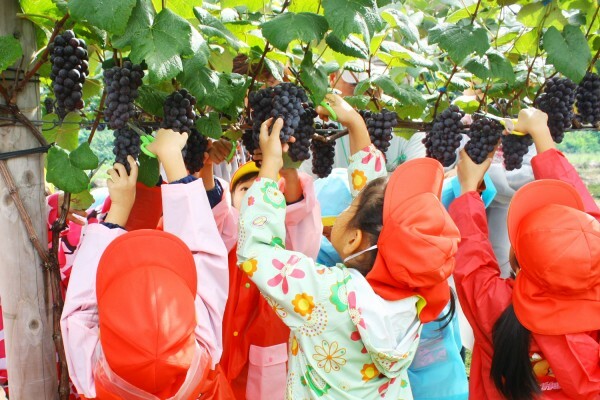 In Tsuruta, currently 1,000t of grapes are produced on approximately 97ha (240 acres) of field. Cherries are also produced widely in Tsuruta. 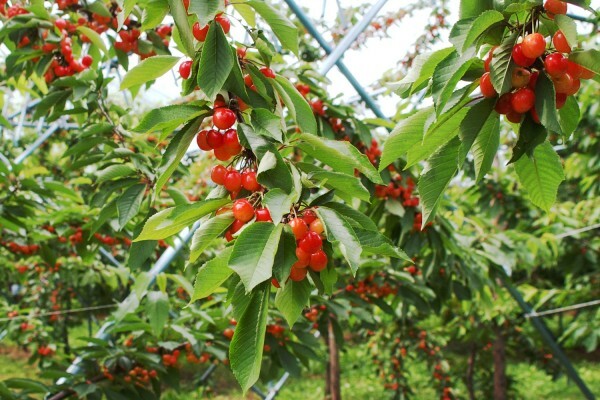 Harvest season for Sato Nishiki and Napoleon cherries is late June to early July. When you are in Tsuruta during the harvest season, come to our orchards to experience picking your own cherries. It is a great family activity. 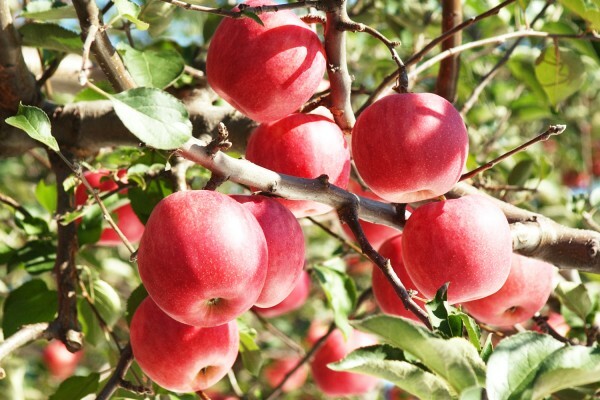 Quality sweet apples produced in Tsuruta include some of the signature varieties found in Tsugaru County; Tsugaru, Senshu, Sekaiichi, Jonagold, Hokuto, Mutsu, Orin, and Fuji.